With our vast industrial experience, we are engaged in offering Supreme Rice Rubber Polisher. We offer our client an excellent quality range of Abrasive Points, which are manufactured from high grade quality raw materials. 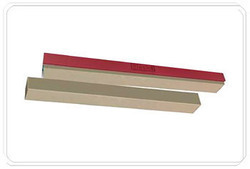 These Abrasive Points can be customized as per our precious customers specifications. We offer a wide array of Rubber Rice Polishers which are made by advanced hydraulic molding method. Used in rice milling operations, these Brakes are constituted from an elastic vulcanized rubber compound which is highly wear and tear resistant. We offer our Rubber Brakes in 2 x 2, 1.5 x 1.5, 1.5 x 2 cross section. We also provide customized bit size on client's demand. We are selling all type of rubber product & rubber polisher. - Rubber Polishers Sizes available from 16"x 2" x 2" to 36" x 2" x 2". - Plain and Male Grooved Polishers are Available. - reduce broken % of rice during polishing. - Bid size as per customer requirement.